For the fourth year in a row electronics magazine Elektor organized the ElektorLive! event at the Evoluon in Eindhoven, The Netherlands. Below is the video of the Robot Student Challange. 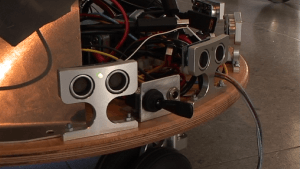 The NASA Knights Team 122 brought along Excalibur, the robot that plays soccer. Bram van de Klundert of Fontys University Mechatronics lab is working on a robot that can navigate a room autonomously.